Throughout her career as a physician and academic leader, Marjorie Sirridge, M.D., became a trailblazer, setting a standard of success for women that is seen today at the UMKC School of Medicine. 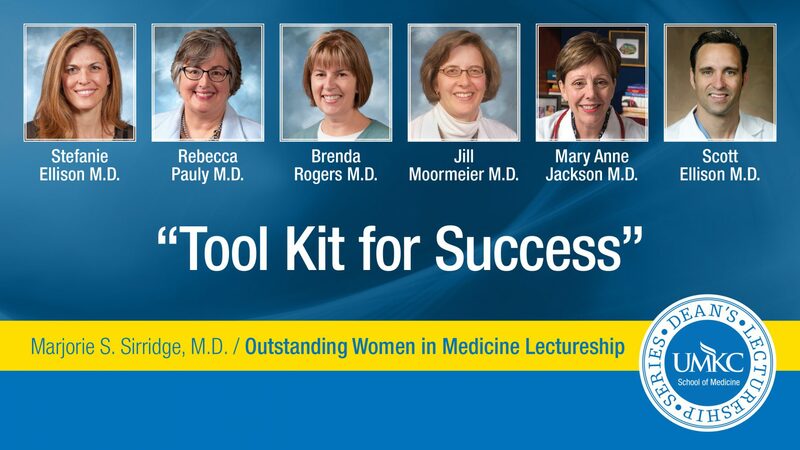 A group of the school’s leaders talked about following Sirridge’s path in presenting a tool kit for success on Thursday at the annual Marjorie S. Sirridge, M.D., Outstanding Women in Medicine Lectureship. The panel included Mary Anne Jackson, M.D., interim dean, Rebecca Pauly, M.D., associate dean for faculty development, Brenda Rogers, M.D., associate dean for student affairs, Jill Moormeier, M.D., chair of internal medicine, and Scott Ellison, a local surgeon. Stefanie Ellison, M.D., associate dean for learning initiatives, served as moderator and opened the discussion with her husband, Scott, discussing the need for a strong support system. The other panelists followed with brief talks on wellbeing, making strategic choices in career advancement, defining success and self-advocacy. Jackson drew on her experience as a medical student in Marjorie Sirridge’s docent unit as she spoke on self-advocacy. She shared her own list of lessons learned from Sirridge such as to think boldly, to follow one’s passion, stand with pride and be relevant, and to be a mentor. “Remember that what you do for yourself as a self-advocate and for each other as other advocates will impact not just your own career but the careers of others as well for generations to come,” Jackson said. Brian Carter, M.D., serves as the William T. and Marjorie Sirridge Professor in Medical Humanities. Carter began the lectureship by recounting the works the Sirridges accomplished and the high standards they set during their tenure at the School of Medicine. The Women in Medicine lectureship was established in 1997 in recognition of Sirridge’s dedication, compassion and advancement of patient care and medical education. Sirridge was one of the School of Medicine’s founding docents and later served as dean. She and her husband, William, endowed the Sirridge Office of Medical Humanities, now the Sirridge Office of Medical Humanities and Bioethics, in 1992.